Foods can spoil faster when exposed to inconsistent temperatures. Even Temp™ maintains a consistent temperature throughout the refrigerator compartment so your food can stay fresher, longer. The divider in the slide out freezer basket keeps food separated and saves the frustration having to dig through other foods to find the one you are looking for. 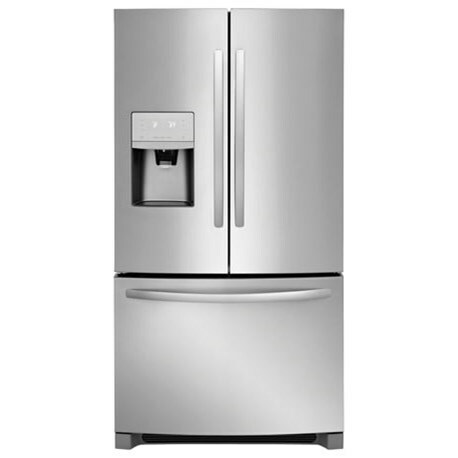 The French Door Refrigerators 21.9 Cu. Ft. French Door Counter-Depth Refrigerator by Frigidaire at Furniture Fair - North Carolina in the Jacksonville, Greenville, Goldsboro, New Bern, Rocky Mount, Wilmington NC area. Product availability may vary. Contact us for the most current availability on this product. Capacity: Refrigerator 22.5 Cu. Ft.
Capacity: Total 22.5 Cu. Ft. Shelf Area 22.97 Cu. Ft. The French Door refrigerators in this collection display the latest features and technology that will keep your food fresh and organized. Through meaningful innovations, their design is uncluttered, controls that are intuitive, and features are as sensitive as they are smart. SpaceWise™ Organization System, Effortless™ Glide Crisper Drawers, Effortless™, Glide Freezer Drawers, and Store-More™ Full Width Cool Zone™ Drawer are some of the main features of these pieces. The unique PureSource Ultra Water Filtration also offers best-in-class water filtration so you get cleaner, better-tasting water at your fingertips. Create the kitchen of your dreams with a French door refrigerator from this collection!